Commonly pronounced in the US as pa tee’ne, or puh tee’nuh”. Most broadly defined as the observed and physical change in a surface over time caused by exposure to oxygen or other environmental elements and compounds. On metal, it is the film of corrosion on the surface caused primarily by the reaction of the metal with oxygen. To put it in perspective, think of an old penny, a rusty pipe, or the Statue of Liberty. However, there is more to it; The natural rate of change depends upon the aggressiveness of the environment. Since the level of pollutants, rainfall, and acidity vary locally, the rate, chemical make-up, and therefore the color and depth of the patina will also vary. 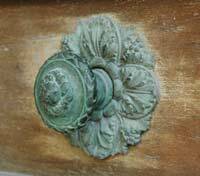 Rates of patina build-up and color will change year-to-year, and even seasonally. Patina is not confined to metal. It can also refer to the change over time in wood or the long-term change in furniture or other items, caused not only by oxidation, but by repeated cleaning, rubbing and polishing. To summarize, patina is the rich and often lustrous natural toning once only available by waiting months, decades, or eons. Because of the time factor, surfaces with a fine patina often command a premium price. 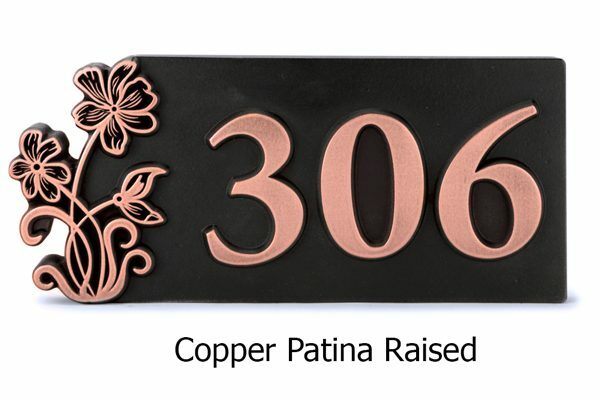 At Atlas Signs and Plaques, copper, bronze and brass are among our most popular coatings. These have some similarities in the way they naturally patina. Although other elements can be included in the mix, bronze and brass are primarily alloys of copper along with tin and zinc, respectively. The natural coating that develops on these copper-based metals can range from brown to green, all in a multitude of shades and hues, depending on time and environment. 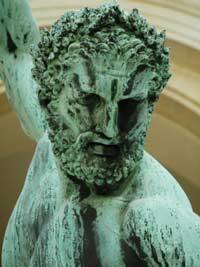 The desirable green shades (formations of copper carbonate) used to be called Verdigris, but in modern times are usually shortened to Verde or Verdi. (We use Verdi). 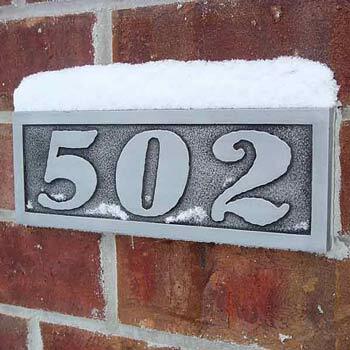 The layer of patina, interestingly, can protect against continuing corrosion and is encouraged to provide a protective barrier against further deterioration. However, this is less likely to be the case in larger cities or areas with higher levels of natural or industrial pollution. In these cases, the green and blue colors are mainly from copper sulfides and are not protective, allowing corrosion to wreck havoc of deterioration beneath the surface. Areas of harmful or beneficial patina can flake-off allowing the patina process to begin anew on that area. 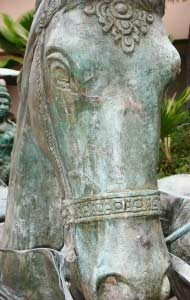 This phenomenon, can be responsible (along with pigeon poop) for some of the wilder examples of patinas shown. While we have been reviewing copper and copper alloys, common rust in all its splendid coloring, is a patina effect on iron and iron alloys such a steel. Rust is iron oxide formed by the reaction of iron and oxygen in the presence of water or atmospheric water vapor. We think rust is beautiful!! Unknown to many, even aluminum forms a surface oxidation (patina) of aluminum oxide almost immediately. It often goes unnoticed because it is, most commonly, in a whitish crystalline form. 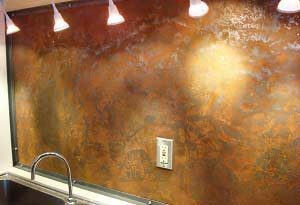 Like the patina on copper and copper alloys, the surface oxidation on aluminum protects the metal against further deterioration. 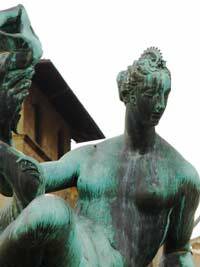 Wide variations in patina are normal whether naturally developed or artist applied. Several items from San Francisco’s Golden Gate Bridge are shown because we think it is very interesting that even items from the same era and environment can differ so greatly. Also contrast the Golden Gate examples, which are only 70 years old with some the centuries old European pieces. Subscribe to our e-mail newsletter to learn about monthly discounts, specials and giveaways.